Smoked is darkened and wristwatches removed. As published in Ogoniok in 1945. Red Army soldiers raising the Soviet flag over the Reichstag (parliament) as they defeat Hitler’s Army. This photo became a World War II icon and one of the most widely published war photos of all time, symbolizing Soviet triumph over Nazi Germany. Yevgeny Khaldei, a Soviet Army photographer in Moscow, had his uncle sew a tablecoth into a large Russian flag. The photographer then flew to Berlin with the intention of recreating photographer Joe Rosenthal’s iconic image of US Marines raising a flag on Iwo Jima. 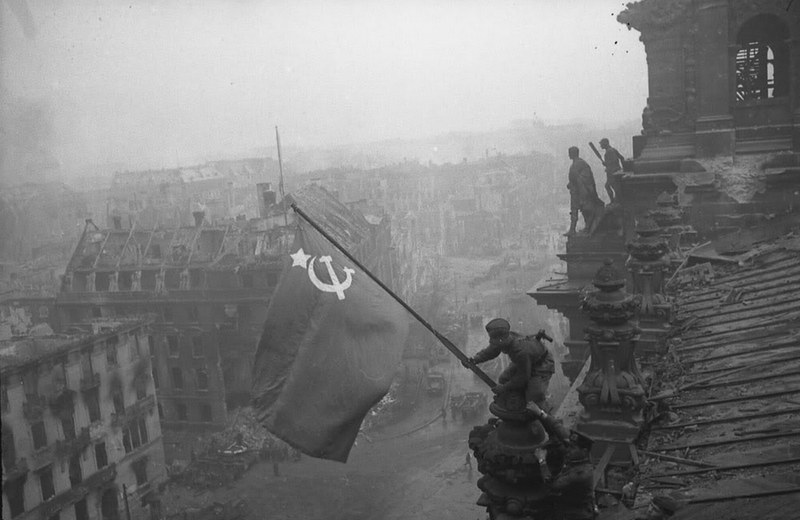 Khaldei took soldiers to the Reichstag roof, had them pose with the flag in a journalistic fashion, then quickly flew back to Moscow to develop and print his film. Before the photo’s first publication in Ogoniok, a Russian magazine, Khaldei scratched from the film negative multiple wrist watches worn by the Russian soldiers, concealing Soviet Army looting. Dark clouds of smoke were added in a later version on the photograph. "Khaldei saw himself as a propagandist for a just cause, the war against Hitler and the German invaders of his homeland. In the years before his death in October 1997 he liked to say: 'I forgive the Germans, but I cannot forget.' His father and three of his four sisters were murdered by the Germans." 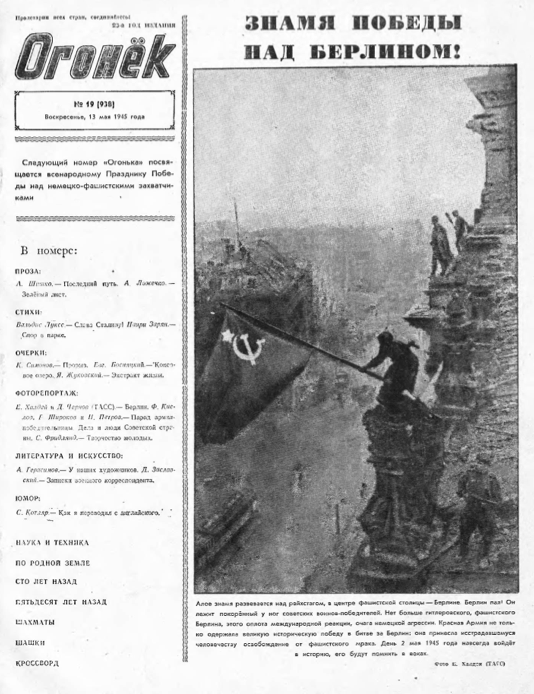 - Der Spiegel, "The Art of Soviet Propaganda"
Watch the short video, "Flag on the Reichstag"